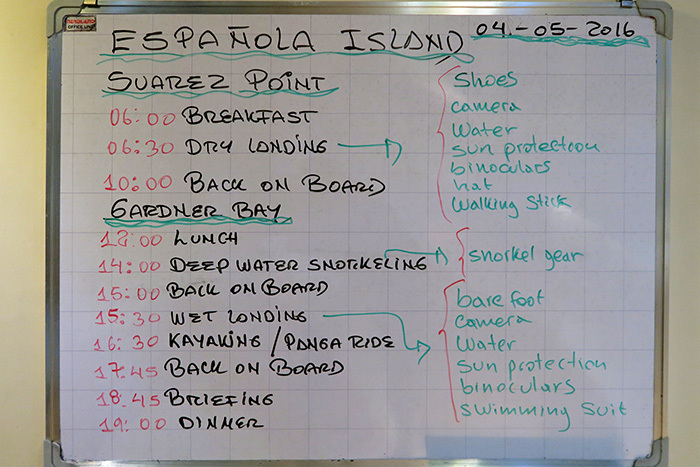 In the morning, you will visit Suarez Point . On the trail you will have the chance to see blue-footed boobies, albatrosses, and Nazca boobies. This island is the breeding site of nearly all of the world’s 12,000 pairs of waved albatrosses. You will also visit a beautiful site on the ocean front where there is a cliff that the large albatrosses use as a launching pad! You will have the chance to see the famous blowhole that spurts water into the air. The landscape is great for photography. Highlights: Hood mockingbird, Nazca boobies, waved albatross (from the last week of April until the last week of January), red-billed tropicbirds, lava lizards, Galapagos hawk, blue-footed boobies, blow hole, amazing landscape. In the afternoon, your excursion takes you to the spectacular Gardner Bay. After landing, you can walk across a lovely white-sand beach amongst a busy sea lion colony or dive into the water to swim with sea lion pups. You may also see curious mockingbirds on the beach.